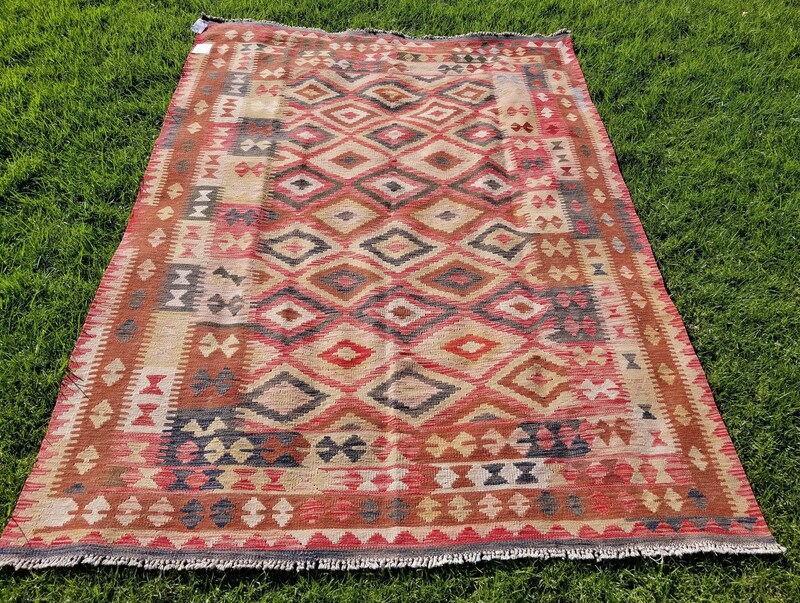 6'6" x 9'2" (202 x 280 cm), Vintage, Distressed, Rustic, Brown-Mint Green-Red Color, Muted, Pastel, Tribal, Geometric Design, Boho Kilim, Nomadic Kilim, Central Turkey, Handspun Wool pile (Weft) on Handspun Wool foundation (warp). Condition: All our rugs are professionally cleaned and are ready to use. Color: Most of our rugs are photographed in natural light, outdoors without direct sunlight, and the pictures are not altered. 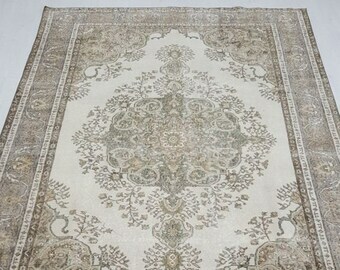 Please consider the lighting of your space when choosing and purchasing a rug. If you'd like to see additional photos, close-ups, etc. to help in your decision making, just send us a quick message - we're happy to accommodate. Abrash: A term used to describe color variations found in select handmade rugs including but not limited to the appearance of colors when looked at either the top or bottom direction (darker or lighter look). Although such inconsistencies may be perceived as 'flaws' in coloration, abrash is actually a much more intimate and complex characteristic. For more information on abrash, please see http://www.rugrag.com/post/Abrash.aspx. 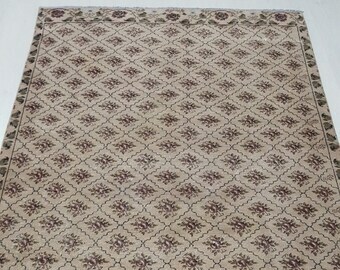 Rug is beautiful and just as expected. Very nice and friendly owner of shop. Shipped immediately. Beautiful rug. Just like in photos. Sturdy for use as a kitchen runner. Erhan was quick with responses and shipping. Love my new pillow cover! It came very quickly, looks exactly as pictured. I couldn’t be more pleased. Would definitely order from them again!! We do offer wholesale business. Please contact us over ETSY. 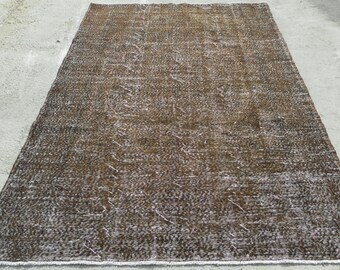 We do and we can have custom rugs built to your design, color, size specs. If you have any specific questions about the listed sizes, please contact us before making a purchase decision. Unfortunately, we don't offer gift wrapping and packaging given the bulky nature of these rugs and the need to protect them during shipment. In case of return(s), Buyer pays all shipping costs both ways, plus other applicable fees such including but not limited to transaction fees.